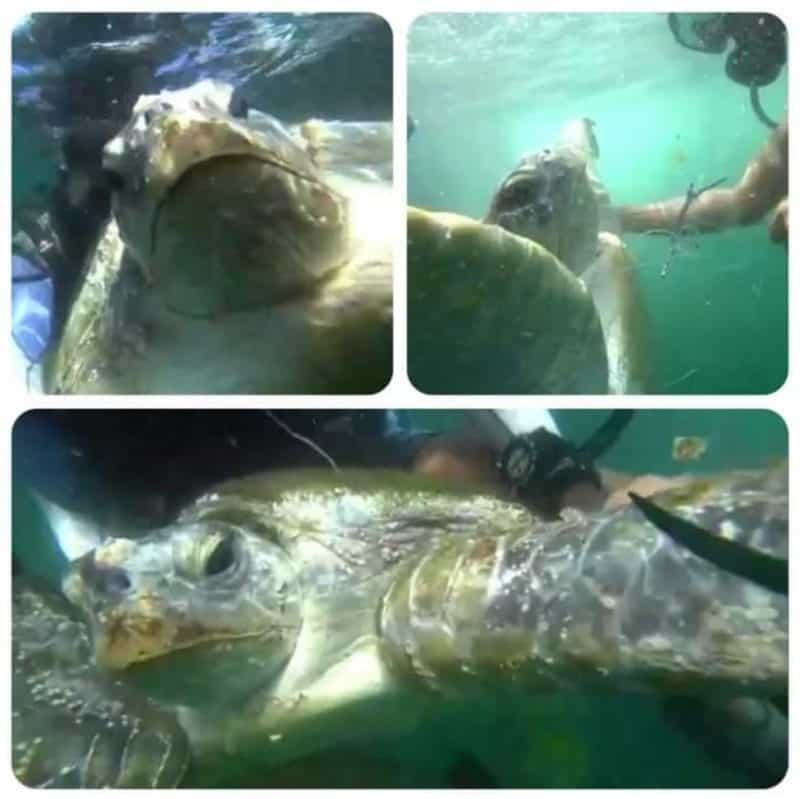 Last September 27, 2018, we came across a poor sea turtle, entangled in fishing lines while diving at Dibba Rock, Fujairah and we saw the anguish in its eyes as it glided near us. We knew right there and then that we had to come to its aid, so we immediately sprung into action! 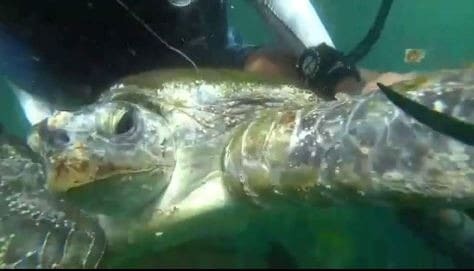 Fishing lines were entangled around one of its flippers making it difficult for the sea turtle to swim normally. Upon inspection, we saw that the cord was deeply embedded in its flipper which was already affecting its blood circulation. The poor creature was obviously struggling to swim and we could only imagine the pain that it was in. We don’t know how long the sea turtle has been tormented with that excess baggage but it certainly didn’t deserve to suffer like that. It took us several minutes to cut and loosen the fishing lines to free the sea turtle from the foreign object that ensnared it. There were already signs of swelling where the line had dug into the flipper and we’re glad that we were there at the right time and place to help the poor creature. The cord would have probably buried itself deeper causing lacerations if it was left alone for much longer. 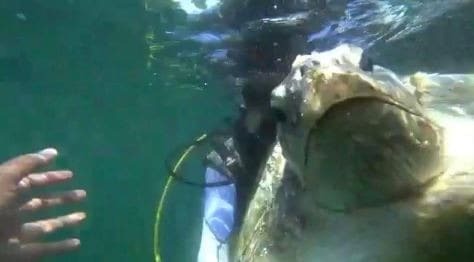 We made sure that we got every inch of that cord before letting the marine animal go and when we finally did, we felt incredibly happy watching it swim without having to drag that awful angler’s line wrapped severely on its flipper. We swam with it for a while to observe if it could manage on its own and we were happy to see the creature swim with strength and vitality unlike when we first encountered it. The creature didn’t mind us tagging along and we knew deep inside that it was grateful for its renewed sense of freedom. We brought back the fishing line that we removed from the creature back with us to dispose of it properly and make sure that it never finds its way back into the ocean. Every year, more and more garbage, particularly plastic end up in our oceans and endanger the lives of marine creatures including the beloved sea turtles. Based on the International Union for Conservation of Nature (IUCN), six of the world’s seven species of sea turtles are currently listed in its Red List Website as vulnerable, endangered, or critically endangered. The biggest threat to them and many other species around the world is incidental capture in fishing gear, also referred to as bycatch. Marine creature deaths by incidental capture or entanglement are attributed to longlines, drift nets, trawls, gill nets, pots, and traps. Other ocean debris like plastic bags, balloons, and other plastic items also claim the lives of sea turtles that confuse it as food such as jellyfish. Ingesting plastic by mistake can lead to blockages within the digestive system and death of the underwater dweller. Reduce plastic waste – Avoid single-use plastics such as straws, plastic bags, disposable plastic food containers, plastic take-out utensils, and so on. Many of this garbage that ends up in landfills and finds its way to the ocean may cause marine animal injury or death. A good way to minimize plastic waste is by recycling and using reusable versions of commonly used plastic items (reusable stainless steel straws, eco bags, reusable food containers, and stainless steel utensils). Turn out lights visible from the beach – Artificial lights can discourage an adult female turtle from nesting on the beach and it can confuse hatchlings to head inland instead of the ocean. To prevent these from happening, you can either shield, redirect or lower the intensity of your lights within your property. Avoid nesting and hatching sites – The presence of too many people, with their flashlights and not to mention the noise that they create can easily disturb nesting females and baby turtles. Make sure that you give nesting places plenty of space and be aware of hatching areas to avoid trampling over hatchlings as they make their way to the water. Reduce the use of chemicals – The chemicals that you use in your household such as chemical cleaners can wash into the coastal waters and kill marine flora and fauna. Promote the use of biodegradable cleaners that are both safe to humans, plants, and animals but if you cannot avoid the use of certain chemicals, make sure that you dispose of them properly. Volunteer to clean up the ocean and the beach – You can help the environment by simply picking up trash that you see along the beach and disposing of them properly. You can also participate in clean up programs in your area like what we do at Nemo Diving Center. In fact, we recently took part in the clean-up dive for Fujairah Sea where we collected different plastic items from discarded fishing nets to rusted metals. These are just a handful of ideas but there are plenty of other ways to help the growing problems in our oceans that threaten marine life. It doesn’t matter how small your contribution is; as long as we all do something, we can help make a big difference.